Students at Texas Southern University receive free tickets to see "Homecoming: A Film By Beyoncé". 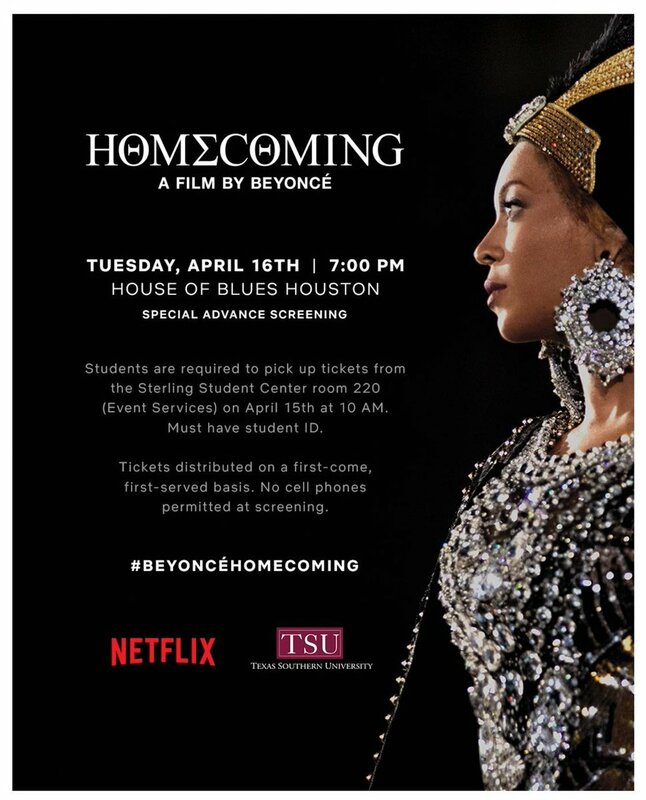 HOUSTON, Texas (KTRK) -- Texas Southern University is hosting a special early screening of Beyoncé's new documentary "Homecoming" for students. The documentary premieres on Netflix on April 17, but TSU students will get to see it early on April 16. "Homecoming: A Film By Beyoncé," will give fans an in-depth look at Beyoncé's 2018 Coachella performance. Beyoncé headlined the festival, becoming the first African-American woman to do so. Drummer and Prairie View A & M graduate Maurice Mosely is one of the musicians featured in the documentary. "I gave him one of those looks like, 'Yeah, right.' And he says, 'No, I'm serious. It's for Beyoncé. And I was like, 'Word?' He was like, 'Yes.' And I was like, 'Oh snap.' My heart was pumping. I was excited," Mosely explained. A Prarire View grad is sharing the story of how he was able to perform with Beyoncé. The speculation that Netflix might be involved with a Beyoncé-affiliated project began when the streaming service tweeted the word "Homecoming" written in Greek letters on a yellow background. Members of the Beyhive, a.k.a the fans who devoutly follow Beyoncé, got to work pulling clues from the elusive tweet, noting that "Homecoming" is the name of a fashion collection by the star as well as her scholarship program, the Homecoming Scholars Award Program. The film "reveals the emotional road from creative concept to cultural movement." Queen Bey is going to drop a Netflix documentary next week.